An agenda of constitutional amendments, structural changes and referendum votes for raises and rights. Whitman penned his essay on the American experiment in 1871. And there has been much progress since. Yet, there is much history yet to be enacted. So why not make 2014 historic? Why not assert a progressive politics that is more vital and determined than what has been known to this point? Why not stop reacting and start asserting a real reform agenda? 1. Demand a Right to Vote for all Americans. 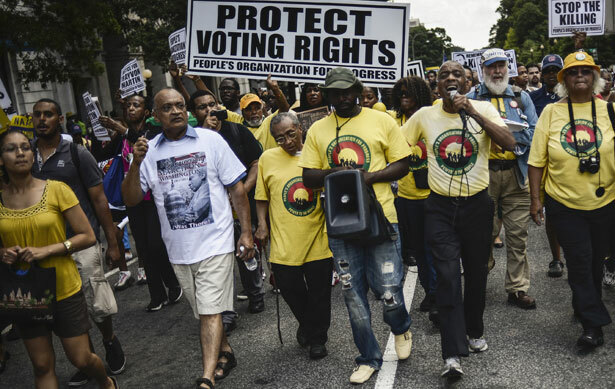 The last decade has seen a steady assault on voting rights in the United States, with restrictive Voter ID laws, changes in early-voting and same-day registration rules and, in 2013, a US Supreme Court ruling that Congressman John Lewis, D-Georgia, said “stuck a dagger into the heart of the Voting Rights Act of 1965.” The Department of Justice and key members of the House and Senate have taken steps to counter the assault at the federal level, and state-based efforts such as North Carolina’s “Moral Monday” movement are pushing back. These efforts are vital. But voting rights are too precious to be left to chance. They need to be defined and defended permanently. That’s why Congressmen Keith Ellison, D-Minnesota, and Mark Pocan, D-Wisconsin, have proposed a constitutional amendment to explicitly guarantee that every American has a right to vote and a right to have that vote counted. “The right to vote is too important to be left unprotected,” says Pocan. Groups such as Color of Change and FairVote agree. They’re campaigning to get co-sponsors for the proposal by Ellison and Pocan. So far, 20 members have joined their effort. In 2014, it’s important to pressure sitting members of Congress to sign on, and to make candidates for Congress take a stand on whether they believe Americans have a right to vote. 2. Get More States on Record for Real Reform of Elections. Sixteen states have formally petitioned Congress to enact a constitutional amendment to overturn the US Supreme Court’s Citizens United ruling—which frees corporations to spend as much as they choose to influence elections, and which continued a process of striking down federal, state and local campaign-finance reforms. These states have formally recognized that votes should define the electoral process, not dollars. Groups such as Free Speech for People, Move to Amend, Public Citizen, Common Cause and People for the American Way have made tremendous progress at the local and state levels—working with limited resources and shamefully scant media coverage. They’ve won support from Democrats, Republicans and independents in state legislatures across the country, and they’ve organized and won statewide and local referendum votes. “In just three years since the Supreme Court’s Citizens United ruling, we have come one third of the way to amending the US Constitution to reclaim our democracy and to ensure that people, not corporations, shall govern in America,” says John Bonifaz, co-founder and executive director of Free Speech For People. But there is still much work to do. The real “critical mass” moment will not come until current numbers double and the movement is in range of the number of states that would be required to approve an amendment: thirty-eight. Roughly 100 House members have sponsored or cosponsored amendment proposals, as have key senators such as Vermont independent Bernie Sanders and Ohio Democrat Sherrod Brown. Getting more states to formally demand action will cause more congressional buy-in for this necessary reform. Senator Bernie Sanders is right when he says of the current federal minimum wage of $7.25 an hour, “Most people understand that is a starvation wage. Individuals can’t live on it, families can’t live on it.” Working with the ranking Democrat on the House Education and Workforce Committee, California Democrat George Miller, and Senate Education, Health, Labor and Pensions Committee chair Tom Harkin, D-Iowa, Sanders is pushing for Congress to raise the federal minimum wage to $10.10 an hour and index future increases to the rate of inflation. That’s a good start, but it’s a tall order in the face of determined opposition in the Republican-controlled US House. But the circumstances of millions of American workers can be improved even if Congress fails to act in 2014. In November 2013, New Jersey voters hiked that state’s minimum wage to $9 an hour and indexed future increases to the inflation rate. And in Sea-Tac, Washington, voters took the local minimum wage to $15 an hour. With the election of Kshama Sawant, a socialist who ran on the $15 wage issue, to the Seattle city council, there is now a major push in that city for a significant wage hike. If Seattle votes on a $15-an-hour wage referendum this fall, it will be as part of a pattern of critical state and local initiatives—from Alaska to Arkansas to New Mexico to South Dakota—that are designed to allow Americans to vote themselves a raise. The Equal Rights Amendment struggle of the 1970s and early 1980s was an intense, inspiring and heartbreaking fight to finally guarantee equal rights for women. A massive right-wing pushback prevented the project from succeeding at the time—although it opened up debates that would lead to significant progress on a number of legislative fronts. In recent years, there has been something of an ERA renaissance. Three years ago, on the 100th Anniversary of International Women’s Day, then-Congresswoman Tammy Baldwin, D-Wisconsin, proposed legislation to eliminate the congressionally imposed deadline for ratification of the Equal Rights Amendment. And in February 2013, the New Mexico state House of Representatives formally asked Congress to lift the deadline for ERA ratification. At the same time, new versions of the amendment have been introduced. 5. Work to Make Every Election Matter.